Christmas is just around the corner. Everywhere I go, I can see various Christmas decors hanging on every corner of the streets; and at night, the dancing Christmas lights are grabbing the attention of every passersby, as if the lights want the people to watch them “dance” and change colors every now and then at a perfect timing to the tune of Christmas carols. Well, with Christmas season that is fast approaching, people are likewise busy thinking about Christmas gifts. We all know that Holiday Season is synonymous to party, vacation and of course, gifts! B ut we must not forget the true essence of Christmas, which is giving. Like others, I am also starting to think about the gifts that I am going to give to my friends, parents, siblings, my husband and of course, to the little princess in our life, Baby Sam. In order for me not to missed out someone to give Christmas gifts to, I am now starting to write them down on my list, then ponder on the best gift that I can give to them these Yuletide Season. I must also make sure that the gifts must be something that the recipients will truly appreciate; it must be something that is unique and made especially for that person. Now, as I am writing this post, I have something in my mind (insert light bulb in a bubble thought…lol)! Since I am in a sort of “Baking Business” now, how about if I bake something especially made (or something personalized) for each of the person in my list? I think that would be a great idea, isn’t it? I’m perfectly sure that they will truly appreciate my presents to them because the cakes, pastry and cupcakes are certainly made just for them – they will be made with effort and love, of course. On the other hand, I guess it will not be just a simple Christmas present to them, but it can also be a sort of advertising my edible “work of art” in a way! Now, that’s hitting two birds in one stone! With my long list of names (not literally that long) to give gifts to, I have to also think of some other gift items, especially for my nephews and nieces, who will be more thankful if they receive something like toys (for their age). As for my little princess, I am planning to buy her new baby clothes and other baby accessories. 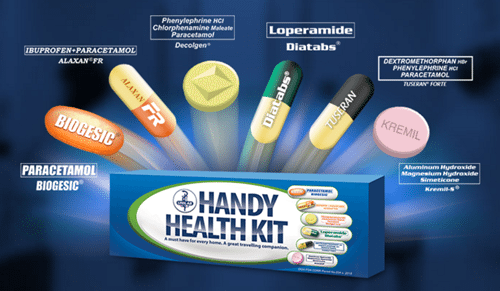 Then for my husband (as well as for myself), I am thinking of giving him (and myself) a Unilab Handy Health Kit as a present which includes medicines such as Biogesic, Alaxan FR, Decolgen, Diatabs, Tuseran Forte, and Kremil-S. This is to always make sure that we are always in optimum health condition so that we will be able to take good care of our baby and, in a way, avoid ruining our Christmas vacation and party when unexpected headache, stomach upset and colds, among others, arrive. Now, after making this post, I am eventually done thinking over with my Christmas gifts ideas to my loved ones. I hope everyone will enjoy the Christmas season!